_ _I may have gone a little overboard with my pumpkin purée purchasing (and alliteration) this fall. I was very excited. But I’ve been stuck looking at all these lonely cans in my pantry giving me doe eyes and guilt trips about not following through on my promises to bring in the season with a pumpkin bake-a-palooza. I’m weak. I’m easily peer pressured by inanimate objects. 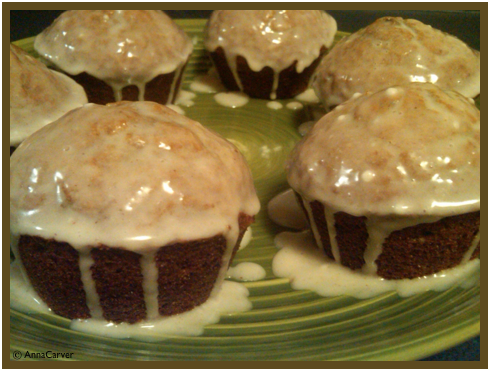 _ _So finally I succumbed and made these amazing pumpkin muffins. Normally suggesting putting fruit or nuts into baked goods would get you a slap across the mouth, but the raisins in these are so very necessary. I’m literally ordering you to include them. I’ve made these muffins both ways and the plain ones were just that… The toppings however, are totally optional. Half I made with streusel and the other half were dipped in a cinnamon glaze. _ _With my roommates being responsible human beings, I can’t count on them to eat more than one muffin each, which leaves 21 for me to stuff down my gullet. I made this batch yesterday… only half a dozen to go. 1. Preheat oven to 400°F and grease and flour muffin tin or fill with liners. 2. In a large bowl, beat the eggs, sugar, pumpkin, vanilla extract and oil until blended. 2. In a separate bowl sift together the dry ingredients. 3. Beat the dry ingredients into pumpkin mixture until just combined. Fold in raisins. 4. 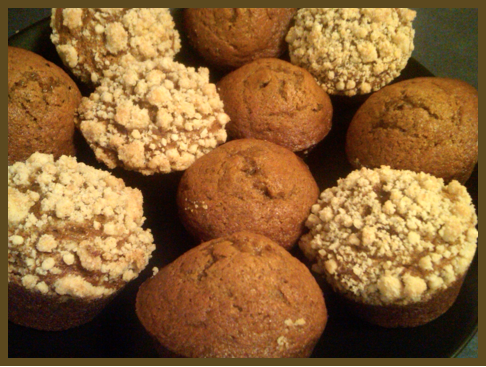 Fill the muffin cups to 3/4 full and sprinkle generously with streusel topping if using. *If using the glaze, bake muffins plain and after they have cooled, dip them into the bowl of glaze. I like the way it looks dripping down the sides so I help it along by spooning more around the edges.